You can’t talk about parenting without talking about discipline. And you can’t talk about discipline without the great “To Smack or Not to Smack” debate. Now experts are calling on smacking to be made illegal. Oh, this is nothing new. Is any parenting debate ever over something “new”? Most people have quite strong opinions and feelings about this topic, for one side or the other. I used to feel very strongly that I would smack my child/ren and that was that. Now that I’m a parent, my opinion has completely shifted. There are two main reasons for this, and they’re simple. I can’t tell him in one breath that it’s not ok to hit people, then turn around in the next second and hit him. And I wouldn’t like to be hit by anyone, but especially not by someone bigger than me who is supposed to love me. Can you imagine how frightening it must be for a child to have this adult, who towers over them, who they just want love from, to wind up and smack them? There may be a line between smacking for discipline and “abuse” but I tell you what, that line is very fine. Let’s de-bunk the excuses. It’s not abuse, it’s discipline. So is it ok for a husband to “discipline” his wife because she doesn’t do what he asks or expects of her? Is it ok for kids to discipline other kids in the playground because they’re misbehaving or not doing what that child wants them to? If you do it once you shouldn’t have to do it again. So by hurting them, shaming them, and smacking them, they’ll now fall into line whenever you want them to? And what lesson has that taught them? And what if you do have to do it again? I was smacked and I am fine. I’d every person who was smacked as a child and says they’ve turned out “just fine” to ask yourself, have you? Have you really turned out just fine? I thought I had, but I have suffered depression, severe anxiety, fears over completely irrational things. Who is to say some of that didn’t stem from being smacked* as a child? You have to teach them who’s boss. Do you? Are you “the boss” of your children? What does that even mean? There are many things we, as parents, need to teach our children. “Who’s the boss” isn’t one of them, unless you’re fond of the 1990s Tony Danza series. It’s our job as parents to protect our children. It’s our job to teach them respect, manners, right from wrong. It’s our job to teach them how to treat others. Most importantly, it’s our job to love our kids, and frankly, that shouldn’t even be a “job”. I am not a perfect parent. I get frustrated when my son doesn’t listen, or doesn’t do what I ask him, when I ask him. I know the feeling of wanting to smack my child, and thinking that will “teach him.” But nothing hurts me more than seeing fear in his eyes. Nothing hurts me more than knowing that I am the one who has hurt him, whether it’s something I said, or because I’ve taken something away from him. I know that it is my job to discipline my son, but I also know that there are so many ways to discipline a child without resorting to smacking. Instead of fighting bad behaviour with worse behaviour, try other methods. Take away TV or video game privileges. Send them to time-out. Or instead of punishing bad behaviour try re-enforcing good behaviour. A quick google search led me to this article on WebMD and I am sure you could find many more. Dr. Phil has a brief list of age-appropriate discipline. Having said all of this, while I am against smacking and it’s not our preferred method of discipline, I don’t see how banning smacking could be effectively policed, and I also wonder how far the government is willing to go to dictate and enforce this, or other parenting duties. And what about the angsty kids who taunt their parents with “You can’t hit me, I’ll tell the cops” or worse, tell the cops you did it when you didn’t. I know parents will continue to smack, regardless of what I or any expert says, and regardless of what the laws are. But I challenge you to find an alternative discipline method, and just give it a go. I promise you’ll feel far less guilty than you do when you smack them. And if smacking your child doesn’t make you feel guilty, then maybe it’s not purely for discipline. *Smacked is the term being used, but I think if you were smacked, slapped, wooden-spooned, or hit with a belt it is all the same thing. Some people may say the wooden spoon and belt are worse, but I think in the end it’s the same result. I call you my baby, and you say, “No I’m not a baby, I’m a big boy now!” And I know in my head that you are, but in my heart you’ll always be my baby. I decided this year that I would go all out for your birthday, because in the previous 4 years I really haven’t gone to too much trouble for your parties. 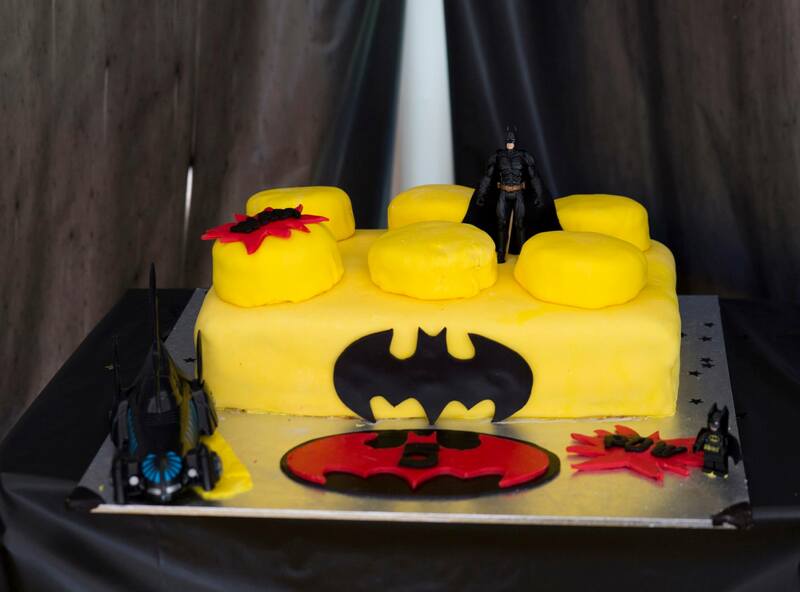 We decided on a batman themed party at the tennis courts. 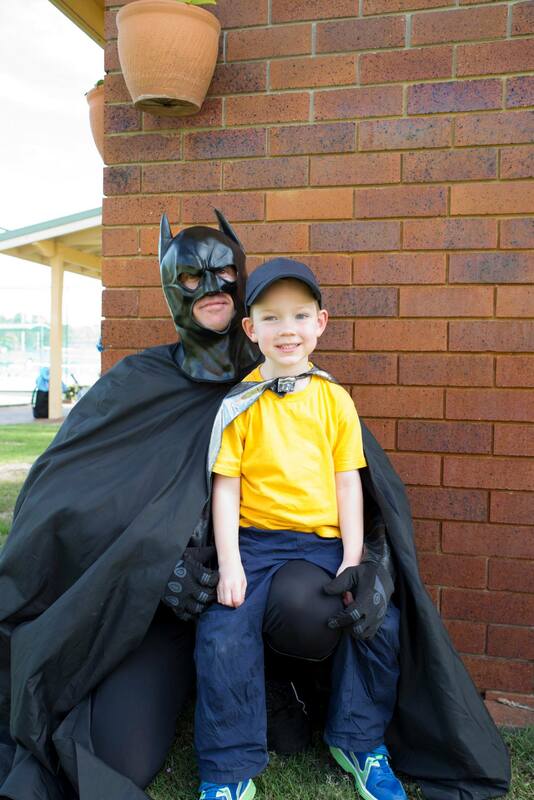 You and 15 other kids had a fantastic time, and Batman himself even showed up, even though one of your friends shouted “He’s not the real Batman! He’s just pretending!” I think you still enjoyed the fact that Batman was there, and it wasn’t until later that night you said, “He wasn’t really batman you know, he was just a person.” My heart broke a little because I thought this might have been the last year I could have gotten away with you actually believing it was batman. In case you’ve always been wondering, it was actually uncle Adrian. You’re half way through your prep year of school, and you are doing so well. It was definitely the right decision to send you to school, even though some of the kids in your class are already turning 6 and you’ve only just turned 5 today*. When you were born I couldn’t imagine having a toddler. Then when you were a toddler I couldn’t imagine having a little boy. 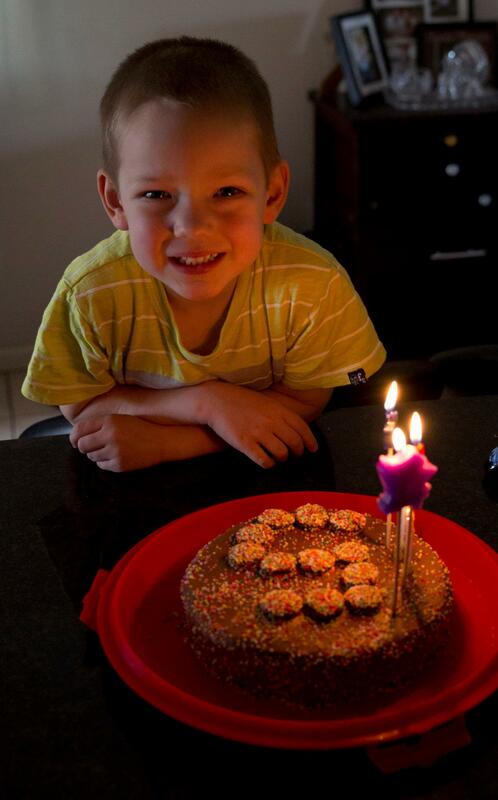 That’s because I couldn’t have dreamed of having a happier, cheekier, more gorgeous, big grown up boy like you are today. You are smart, kind, sweet, and you love to have cuddles and kisses with your mum. You also like to tell the biggest stories, and talk a lot about missing your grandpa, someone you never even got to meet. It makes me wonder if you met him on your way to us. You are constantly talking about getting a dog. Aunty Kayla has two dogs and you are just waiting for the day we move into a house that has a yard so that we can have one too. I would love for you to have a dog, but I also remember how much work they are and I don’t know if dad and I are ready to take on that responsibility just yet. Looking after you is work enough! You think poos, farts and waving your naked bum bum around in our faces is funny. It’s how we know you are truly a BOY! You’re really enjoying playing soccer on Saturdays and you’ve also taken some tennis lessons and enjoy that, too. It helps that you like to be active, because it makes up for all the time you spend playing Wii. 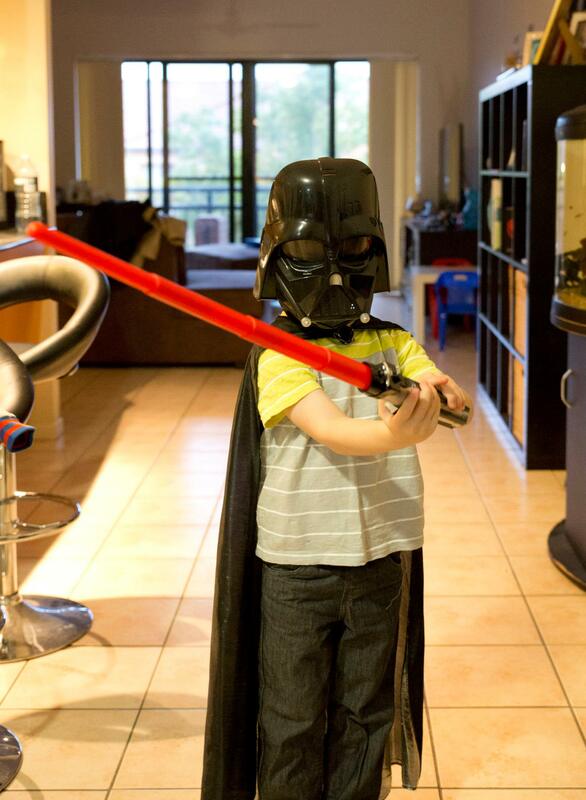 Lately you and dad have been playing Lego Batman wii and Lego Star Wars wii. Most people like Obi Wan Kenobi or Luke Skywalker. Not you. You like Darth Vader and Boba Fett. You also play a lot of reading eggs on your laptop, which is a great tool for helping kids learn. I think your addiction to it might be contributing to how well you’re doing at school. It’s been hard for me to come to terms with the fact that you are now 5 years old. The time has just gone so quickly. You even said to me that you are “this many” and held up 5 fingers. Then you said, “One day I’ll be THIS many” and held up 10. I am certainly not ready for that to happen! I don’t even try to think about what things will be like when you are 10, or 15 or 20. I’d rather just focus on how awesome you are at this age right now. My big 5 year old. You’ll never know how much we love you, until you have a child of your own. It’s a love only a parent can understand. Happy Birthday my perfect boy. I love with you all my love heart, as you would say. “I love you with all my love heart, all the way to my back” and you touch your hands together behind your back.